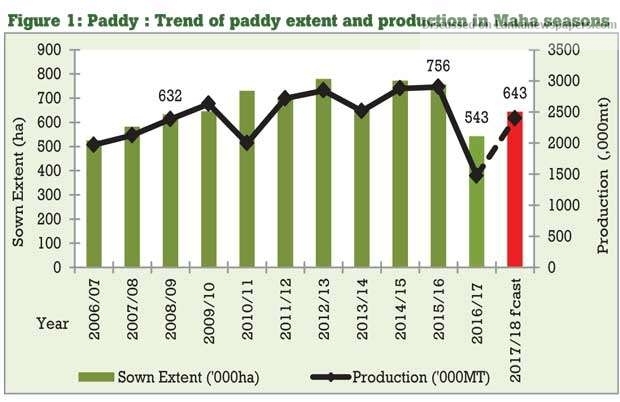 Lanka’s paddy production will increase by approximately 63 percent to reach 2.4 million metric tonnes, in the current 2017/18 Maha season, recovering from the drought experienced during the previous Maha season, the Agriculture Department forecasted in a report. The production for this year will remain below the 2.9 million metric tonne record-breaking harvest experienced two years ago in the 2015/16 Maha season. After accounting for a 6 percent wastage in paddy and the allocation of seed paddy for the next season, 2.21 million metric tonnes of paddy would be available and when milled, would result in 1.51 million metric tonnes of rice available for consumption. “The harvest would be sufficient to feed the nation for 7.5 months,” it said, if the requirements of hotels, hospitals, rice-based industries and animal feed are excluded. The sown extent of paddy was 643,161 hectares, which was 79 percent of the 814,311 hectares targeted for the current season. The shortfall mainly came from the Kurunegala, Puttalam and Anuradhapura Districts, where less than 50 percent of the fields were cultivated. Further, crops were damaged in another 12,112 hectares, mostly from the Kurunegala, Polonnaruwa, Vavuniya and Gampaha Districts, mainly due to the drought and to a lesser extent, pest and diseases. Meanwhile, most of the other field crops were cultivated in 130,942 hectares during the 2017/18 Maha season, reaching 78 percent of the targeted extent but up 151 percent from a year ago. Due to the drought, 3153 hectares of other field crop cultivation was affected, especially maize, black gram and green gram. Vegetable cultivation reached 82 percent of the target, with 39,843 hectares, although this progress was lower than observed a year ago, the Agriculture Department said. Cultivation below 75 percent target was recorded for beet and radish among the upcountry vegetables and snake gourd, ash plantain, luffa and eggplant among the low country vegetables. The disruption of agriculture supply chains was one of the main culprits for an uncontrollable rise in the price levels last year. The staples such as rice and coconut had a disproportionate effect on inflation, since they are protected from imports under a self-sufficiency policy.